The Louisiana Department of Children and Family Services (DCFS) is adjusting its usual SNAP issuance schedule in April to help close the gap for clients who have been stretching benefits during previous months due to the partial federal government shutdown. DCFS will distribute April benefits during the first nine days of the month. SNAP clients should view the April 2019 SNAP Benefit Distribution Schedule to determine the day that benefits will be received. Louisiana will return to its regular SNAP issuance schedule (1st through the 14th) in May. When Will SNAP benefits be issued in April? I need to email LAHelpU.DCFS@la.gov for assistance. What information do I include in my email? Detailed information on what you are requesting assistance with. PLEASE DO NOT SEND YOUR FULL SOCIAL SECURITY NUMBER. What are the steps I must follow to apply for benefits? In order to apply for benefits, you must first create an online account for CAFÉ on the DCFS website (http://www.dcfs.louisiana.gov). After you successfully create your account, navigate to the My Applications Page of the CAFÉ Customer Portal and complete an electronic application for benefits. A DCFS staff member will contact you for an interview, if applicable. 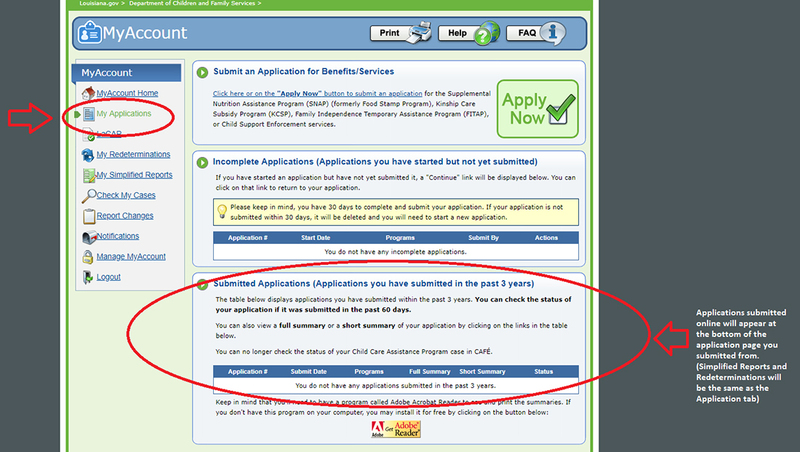 You can monitor the status of your application through the Application Status Page of the CAFÉ Customer Portal. How do I create a CAFÉ account, reset my password or get my account unlocked? Please refer to the CAFÉ Account section of our Online Help Desk. How can I get help applying for benefits? How do I find a local office or DCFS Community Partner to assist me? Go to the DCFS website (http://www.dcfs.louisiana.gov) and click on About Us and click on Find an Office. Enter your Parish, City or Zip Code see the list of DCFS offices and Community Partners located nearest to you. Gold-level partners have people on-site who can help you fill out an application. A list of Community Partners also can be found here. You can also contact DCFS at 888-524-3578 between the hours of 7:30 am and 6:00 pm Monday through Friday or by email at LAHelpU.DCFS@LA.GOVand request information about the DCFS office nearest to you. Which type of application should I complete? If you do not currently receive benefits and wish to complete an application, you should complete an application through the My Applications Page on the CAFÉ Customer Portal. If you already receive benefits and received notification that it is time to reapply for continued assistance, you should complete a redetermination through the My Redeterminations Page. You may only complete a redetermination if it is time for your redetermination to be completed. If you already receive benefits and would like to report changes, you should complete a change report through the Report Changes Page. If you would like to submit a simplified report and received a notification that it is time to submit your simplified report, you should complete a simplified report through the My Simplified Reporting Page. What bills or other information do I need with me when I apply for benefits? The exact list of documents and information needed when applying for benefits varies by applicant. However, it is a good idea to have available basic information about all household members, including their dates of birth and Social Security Numbers, as well as the household financial information such as income statements, available resources, and monthly expenses. If you are a Federal Employee and have been affected by the Federal Government Shutdown, please also have your furlough paperwork as well. How do I know if my online application was received? If no application is listed, you may want to check the middle section called Incomplete Applications (Applications you have started but not yet submitted). If your application is listed here, you will need to click on the application # (This will open your application). Once it opens, make sure all sections are completed, then select Submit. Reminder: When you are submitting your application, redetermination, or simplified report, you will be asked for your PIN. Your PIN was created when you made your login for CAFÉ. If you cannot remember your PIN, please check Manage My Account, as it is listed there. How can I check the status of my applications? After successful submission of an online application, the status of the application will be monitored through the Customer Portal. Online status check is not available for redeterminations; however, you may see if verifications sent to DCFS were received. For Change Reports, users can view if their verifications were received by DCFS, as well. Online status check or verification status check is not available for simplified reports. Application status information for applications submitted through the Customer Portal is found on the Application Status Check Page. The Application Status Check Page allows applicants to view the status and associated denial reasons for applications submitted online through the Customer Portal. The status information for the application is broken down into the various programs applied for with the status of the application listed for each individual program, as well as any relevant reasons for denials, if applicable. How long will it take to complete an application online? In general, it takes about an hour to fill out an application for benefits depending on the application circumstances. If you are unable to complete the full application in one session, click Save & Exit from any screen within the online application to save the incomplete application. An application that is not completed will be stored to the My Applications Page on the CAFÉ Customer Portal for 30 days. How long will it take after I submit my application to find out if I qualify? The eligibility determination process takes up to 30 days from the date of application. I sent in my verification documents for my application/redetermination. How do I know if DCFS received them? For applications, click the My Applications link, then select the View Status hyperlink. From the Application Status Check Page, users can view the status of the application, including the verification status, of the application. For redeterminations, click the My Redeterminations link, then select the View Status hyperlink. From the Verification Status Check Page, users can view the current status of the redetermination. For a faster receipt of verification documents, use the Document Upload tool to submit scanned documents electronically.